This legal text is effectively saying that the author and publisher, and/or anyone else involved in making the book, have created an original piece of work and that the reader is not permitted to do anything with it other than enjoy the text. The modern copyright system began with the Berne Convention in 1886 and has evolved over the intervening decades, and it’s now something we take for granted. It was brought to my attention this week that there is a manifesto proposal by the Green Party to shorten copyright terms to a maximum of 14 years, a move that is causing anger among authors. In most cases, the current system guarantees copyright control for the rest of an author’s life, with control transferred to his or her estate for 70 years after death. If the 14-year proposal were already in operation, this would mean anything produced in the 20th century was now in the public domain. Incidentally, following a change in the law last year, comedians are less likely to be sued successfully if they produce a parody version of an existing work. With so much at stake, there’s a good reason to make it plain who owns the copyright. To this end, many emerging authors place a large copyright and/or © on their manuscript before sending it to a publisher, or on the cover of the book if it’s self-published. Making a big show of copyright is the mark of a nonprofessional. A publisher isn’t going to steal your manuscript unless they’re a dodgy outfit, and if you do self-publish a book, a discreet copyright notice inside will suffice. Make sure it’s drafted by a lawyer or someone who knows what they’re doing; don’t make up your own wording. In any case, copyright exists the moment a work is created, at least in the UK and in the USA. The purpose of the notice is merely an affirmation of the copyright. If you have had something published in a book or in a magazine, make sure you’re receiving the appropriate money from it. Register with the Authors’ Lending and Copyright Society to check whether you could be paid secondary royalties from photocopying, scanning and digital copying. If your book is in a library, royalties are generated each time it’s borrowed, so consider joining the Public Lending Right scheme to collect any money owed. Last night, while stuck for something to watch on TV, I came across an old Rich Hall DVD. I’ve been a fan of his for some years, whether as himself or in the guise of country musician Otis Lee Crenshaw. This DVD featured both personas. In the Crenshaw part, he performs a couple of template songs using the details of audience members to fill in the blanks. Regular readers will know that I encourage every writer to stand up and read their work in front of other people, and one area I like to explore is customising the material to that particular situation. Writers can easily use those same principles of comedy at a reading. The last time I tried a tailored act, I read out a story consisting of six passages from six viewpoints. I placed each passage in an envelope, marked each one with a letter from A to F, and passed a beanbag around the audience. Whenever it was caught by a new person, I asked them to shout out a letter and that would determine the order of the story. Some acts thrive on audience embarrassment, but that’s not to my taste unless anyone is heckling or generally being difficult. When I threw the beanbag, I made it clear that whoever caught it would not be hauled up on stage or embarrassed in any way. And with regard to the rucksacked poet, who doesn’t like free sugary treats? These two approaches kept the audience on-side, while allowing the performer to customise the reading to that particular location on that particular night. In fact, even this entry is situation-specific, as the subject would have been totally different if I hadn’t seen that DVD last night. Rich Hall is also responsible for one of the most bizarre situation-specific incidents I’ve seen on stage. At the Edinburgh Fringe a few years ago, he unexpectedly brought Radio 4 stalwart Barry Cryer on stage as a guest vocalist. If British Rail posted a blog entry late, they would claim it was on time. I, however, make no such claim, but I have been busy over the last couple of days. I shall attempt to restore my Monday timetable from next week. 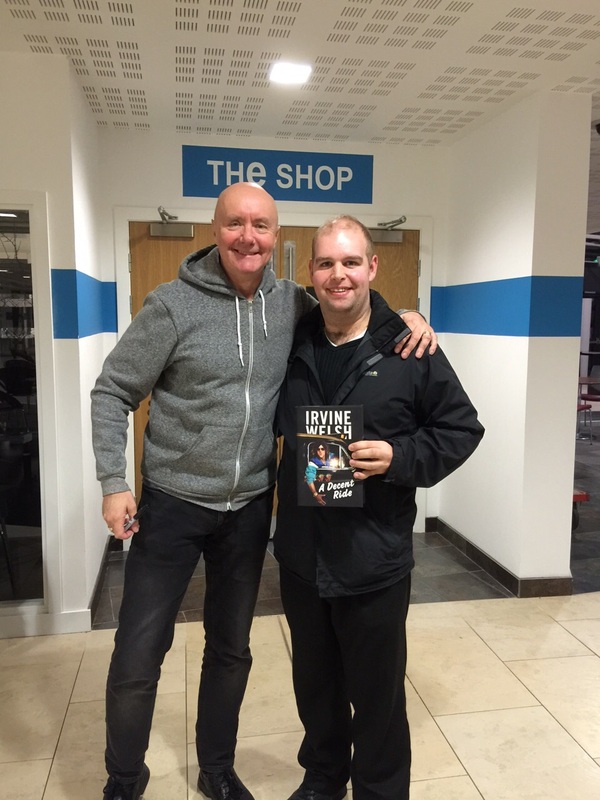 On Sunday, I went to see bestselling author Irvine Welsh launching his latest book A Decent Ride. There were two unusual things about this event. The first was the charge for admission since book launches are usually free in the hope you’ll buy a copy, which I did anyway. The second unusual occurrence was that I asked a question. Welsh was interviewed for 40 minutes, during which time he gave a couple of readings, one dressed as his main character. Then the audience was invited to ask questions, and I asked whether non-Scots readers find his use of slang and dialect a barrier to his work or a way of pulling them into the story. It seems readers struggle a little for the first 20 pages, but slowly learn to adjust. I don’t what it is that stops me from thinking of a question on the spot. It’s not that I’m embarrassed, but I can’t think of something to quiz them about, and I don’t want to rely on the old classic, Do you write longhand or use a computer? If I can think of something, I often go away thinking it was perhaps best to keep my mouth shut so I didn’t ask something stupid. That said, I saw Iain Banks live on stage twice and he invited questions from the start of both events. Again, my author amnesia struck. Shortly after the second event, he announced he was dying and cancelled all future engagements so I’ll never have another chance. For those of you who enjoyed the main event in November, we’re now nearly a week into Camp NaNoWriMo. This is an offshoot project where you have a free choice of what you want to work on, and you can set your own word target from 10,000 upwards. However, this is not what I want to discuss today. One of our group members keeps a WordPress blog about her experience of moving to Scotland, from eating ice cream on a cold day to voting in last September’s independence referendum. Indeed, we boast a number of members from other countries. There’s a joke often repeated that there is no such thing as American English, there is English and then there are mistakes. Joke or not, I find it difficult to agree with this statement, as there are so many variations of English even as you travel within the same country. For proof of this conjecture, just ask people on your favourite social media site what they call the end slice of a loaf of bread and watch the arguments come to a head. Regular readers will know that I’ve so far been published in three countries: England, Australia, and the USA. Sometimes when I send to US publications, I change the spelling and grammar appropriately, with guidance from Microsoft Word and my own knowledge of Hollywood movie dialogue. This isn’t, I admit, a perfect system. And yet the one story published there is written in British English, and that’s because the protagonist is obsessed with acronyms, and changing the location would mean rewriting those acronyms, so the Britishisms stayed accordingly. I know virtually nothing about Australian English, so I stick with my usual spelling and syntax. Here’s where to buy FourW Twenty-Four containing my story, although they’ve omitted my name from the website. I made reference to a motorway, whereas a quick Internet search suggests that highway or freeway might be more appropriate. The type of road is not a major plot point in this piece, nor does the action take place in a specific locality, but I know a few expats who can advise me for next time. While looking up these links, I discovered that another Gavin Cameron wrote a non-fiction book in 1999 about the threat of nuclear terrorism. So if that’s a subject that interests you, it’s the other guy you want to speak to.